The Question:Whenever I start to type in a file or app search on my Windows 8.1 laptop, all sorts of weird suggestions appear. I don’t like it. How can I turn them off? I know exactly what you’re talking about with the search suggestions. It’s the same thing that Google and Bing do when you start typing in a search and it offers up popular searches that start with those words or contain those words. Sometimes it’s great — like on a mobile device where you can type “ymca hou” and it fills in “ymca hours overland park ks” because that’s your location — but other times it’s annoying and when it includes previous searches you’ve done, well, that can be downright annoying. As you point out, though, a search in Windows 8.1 produces some curious suggestions too. 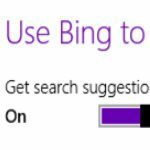 Ask Dave Taylor bing search. permalink.